The drink comes in small 30ml/1oz tubes. Current flavors are blue (raspberry) and red (cherry). Water, Guarana, Sugar, Citric Acid, Flavour, Sodium Benzoate, Potassium Sorbat, Colorant. 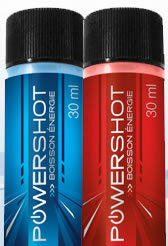 Powershot contains 100.00 mgs of caffeine per fluid ounce (338.14mg/100 ml).